Located one block from famous Waikiki Beach, we offer one-bedroom, furnished condominiums in the Waikiki Banyan. The condominiums are fully furnished and parking and WiFi are free. The condominiums do have partial ocean view. We now offer free Wifi and free long distance calls to US and Canada. 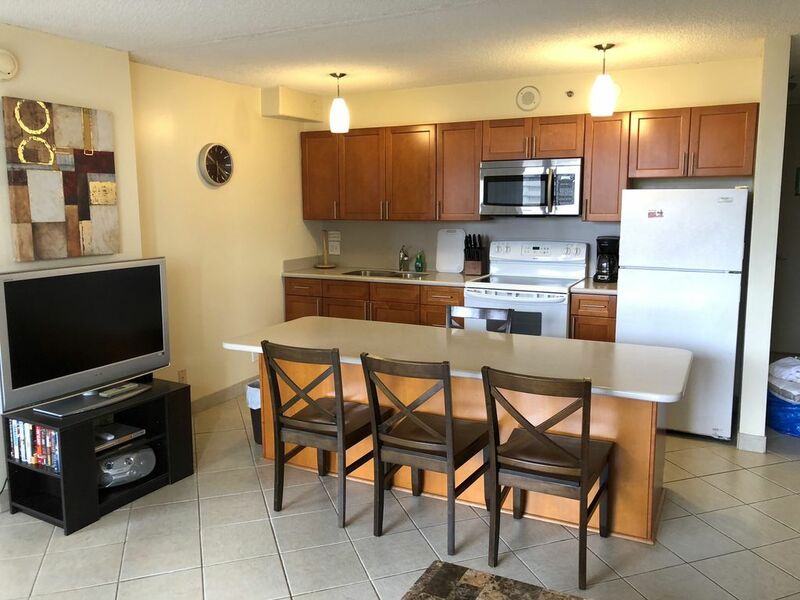 The condo has been nicely renovated offering all the comforts of home. I have regular guest who book Waikiki Banyan condo's unit year after year and are very please with it. The kitchen offer everything needed to cook a simple meal or elaborate dinner. The condo is located on the 12th floor. In my rental business, I clean and maintain the condo's myself. This ensures the level of cleanliness and quality of the condo for my guest. As a resident of Waikiki, I'm always available for my guest needs. I have several condo's in the Waikiki Banyan. Please visit my review section to hear about experiences from my previous renters or email me directly for additional information or questions you may have. The buildings offers a pool, sauna, jacuzzi, barbecue area, and tennis court, also. Security is on duty 24 hours a day and a travel desk is located in the lobby for your convenience. I have been offering vacation rentals in Honolulu since 1996. Prior to my rental business, I have worked for various high end hotels in Waikiki in the customer service field. I enjoy meeting people from around the world and learning about other cultures. Some of my acquaintances through my hotel work and rental business have developed into lifelong friendships. Bath tub and shower both. Located at the end of the hall. We found the apartment nice and clean, as advertised. Very good location, close to everything. We were very satisfied with our stay in Thomas's apartment. We only had to contact the owner for check-in since the code was different. We enjoyed staying here in June 2017. The condo is located in the Waikiki Banyan hotel. There were lots of towels, dishes, extra bedding for our stay. We liked having the kitchenette so we could buy some supplies from Food Pantry during our time in Waikiki. There are tour brochures in the drawer by the kitchen table. It was difficult to open the sliding glass door to the balcony, but other than that we really enjoyed our stay here. Great views of Diamondhead, the city and the beach from bedroom and living room windows. Only a 2 block walk from the beach and many stores and restaurants. It was a 8 minute walk to Food Pantry on Kuhio Avenue, the street behind the hotel. Also, bus and trolleys are only a block away. About a 15-20 minute walk to the new Int'l Marketplace too. Clean and comfortable unit. Since most evening flights don't leave till late at night, we had to find someone to take our luggage for the day since the hotel won't since you aren't recognized as a hotel guest. We used Cliff referred to us by the Marriott next door to the Banyan. Highly recommend staying at Thomas' place while in Waikiki. I was very pleased with the location and amenities at the Waikiki Banyon. Very short walk to the beach! Don't forget to stop at the Honolulu Cookie store on the way for samples! The spa/hot tub was undergoing maintenance during our stay (On a holiday weekend? Would have planned that better!) but the pool was open and the kiddos had a great time. The condo was well stocked with kitchen supplies, towels, and beach chairs. I was under the impression from the photos and descriptions that the bedroom had two twin beds that could be made into a king bed. This would have worked perfectly for my two kids, but alas the bedroom had very creaky queen bed. I had to share with my daughter and my son took the also creaky sofa bed. After a day or two we were so exhausted from all of the activities it didn't matter. Parking was very easy and the Safeway grocery store was close by as well. Check in/out instructions were very easy. We used the a/c at night to block out the street noise and it worked perfectly. Great breeze during the day so we just opened the windows and door and we were very comfortable. The wifi stopped working the last day of our stay but was a good speed up until then. We had a great time and we are already planning our next trip! We stayed for 10 nights and Thomas was so great - he let us in early (the fight from Australia landed at breakfast time) and then was super kind enough to let us have a really late checkout as the flight onto the US was a night flight. He really went out of his way to help us and gave us lots of good ideas for our holiday. The condo building is 2 blocks back from the beach and very comfortable. We got the benefit of a new queen bed and it was super comfy. The condo had everything we needed and made our break most enjoyable. I know Thomas knows his air conditioner is a bit noisy and he is trying to resolve the situation - this was only a minor nuisance for us. Although we had access (including parking) to all Banyan facilities, the Banyan people gave limited help - probably because this is a private rental - we understood this before arriving and it wasn't inconvenient for us. I recently stayed at the condo and it was perfect. The location is excellent ; one block to the beach yet away from the congestion of major hotel beach fronts. The zoo and park are within walking distance. The condo properties have a pool, BBQ, snack area that are well kept and very enjoyable. Thomas had everything prepared for my arrival and was very prompt in replies. This is one of my favorite places to stay. The condo was very clean and comfortable. Spectacular view of diamond head and the ocean. Plenty of dining options within walking. Loved the morning coffee and evenings on the lanai. I look forward to returning! I'll start by saying Thomas was very easy to work with. He was very quick to answer e-mails. The condo was in a great location and it's great that it had a parking garage. Very close to the beach. The Condo was also clean and the kitchen had everything you need. I felt like it was a great value, and I would book with Thomas again. Our cleaning fee is $125. There is no resort fee or amenity fee. Parking and WiFi are included. Please phone for current availability. Rates are subject to change based on availability and season. I do have 6 condo's in the Waikiki Banyan. Confirmed bookings are guaranteed a one bedroom with full kitchen and partial ocean view.